The Ultimate luxury for your eyes. Each strand of lashes is individually styled, elevating its couture status, creating the most glamorous looking lashes. Lavish lashes start out short and gradually lengthen from the inner corners to outer corners of eyes. Cruelty free. The Ultimate luxury for your eyes. Each strand is individually styled, elevating its couture status, creating the most glamorous looking lashes. Contact-lens friendly. Cruelty free. 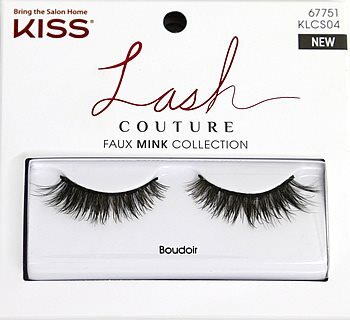 Kiss Lash Couture Faux Mink Boudoir Eyelashes (KLCS04) are sumptuous dark false eyelashes with dense bundled lashes giving way to wispy glam enhancement. This style is fun and edgy to bring out the individuality in your eyes. Transcend everyday beauty with these sumptuously soft faux mink lashes. The "Boudoir" lash style features high-volume, wispy lashes with feathered ends and a fluttery softness. 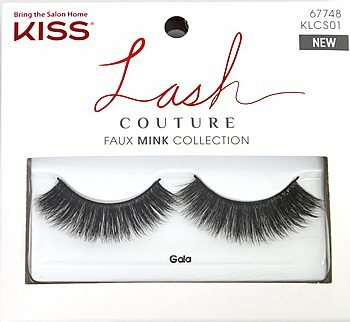 Kiss Lash Couture Faux Mink Collection Gala Lashes (KLCS01) are sumptuous dark false eyelashes with dense bundled lashes giving way to wispy glam enhancement. This style is fun and edgy to bring out the individuality in your eyes. Transcend everyday beauty with these sumptuously soft faux mink lashes. The "Gala" lash style features high-volume, wispy lashes with feathered ends and a fluttery softness. 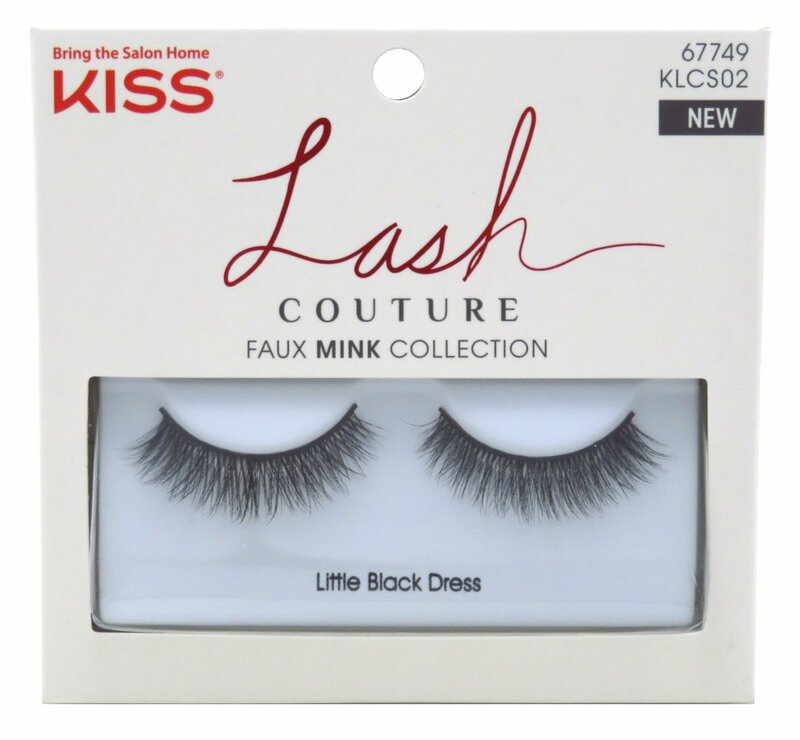 Kiss Lash Couture Faux Mink Collection - Little Black Dress Lashes (KLCS02) are sumptuous dark false eyelashes with dense bundled lashes giving way to wispy glam enhancement. This style is fun and edgy to bring out the individuality in your eyes. Transcend everyday beauty with these sumptuously soft faux mink lashes. The "Little Black Dress" lash style features high-volume, wispy lashes with feathered ends and a fluttery softness. Kiss Lash Couture Faux Mink Collection - Midnight Lashes (KLCS03) are sumptuous dark false eyelashes with dense bundled lashes giving way to wispy glam enhancement. This style is fun and edgy to bring out the individuality in your eyes. Transcend everyday beauty with these sumptuously soft faux mink lashes. The "Midnight" lash style features high-volume, wispy lashes with feathered ends and a fluttery softness. 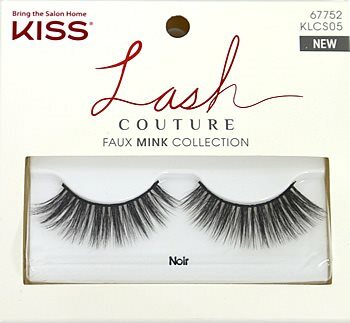 Kiss Lash Couture Faux Mink Collection - Noir Lashes (KLCS05) are sumptuous dark false eyelashes with dense bundled lashes giving way to wispy glam enhancement. This style is fun and edgy to bring out the individuality in your eyes. Transcend everyday beauty with these sumptuously soft faux mink lashes. The "Noir" lash style features high-volume, wispy lashes with feathered ends and a fluttery softness. 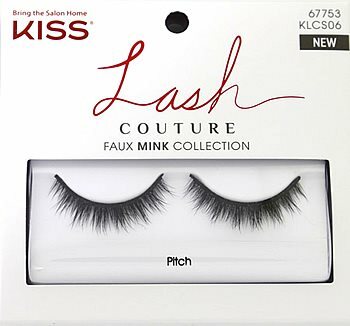 Kiss Lash Couture Faux Mink Collection - Pitch Lashes (KLCS06) are sumptuous dark false eyelashes with dense bundled lashes giving way to wispy glam enhancement. This style is fun and edgy to bring out the individuality in your eyes. Transcend everyday beauty with these sumptuously soft faux mink lashes. The "Pitch" lash style features high-volume, wispy lashes with feathered ends and a fluttery softness. Instant High Impact Look that make heads turn! KISS Lash Couture Triple Push-Up Lashes in Brassiere feature dark, spiky strands that fan out and taper at the ends. Triple Design Technology-3 lash designs in 1 lash band-creates multi thickness and enhances volume, defines length and adds eye-lifting curl. Available in 7 elegant lash styles.